Bringing you a guest blog by Sharrow Carvell. I first met Sharrow (or Spoo as she is known) on a wet and windy Dartmoor ride. It was obvious from the off this girl had guts, and she soon became a well respected member of our group with her grit and determination, but when she told me she was riding the Twentyfour12 12 hour solo I was surprised. Surely you would want to ease yourself into an event like this with a team on your first event? But I was wrong. 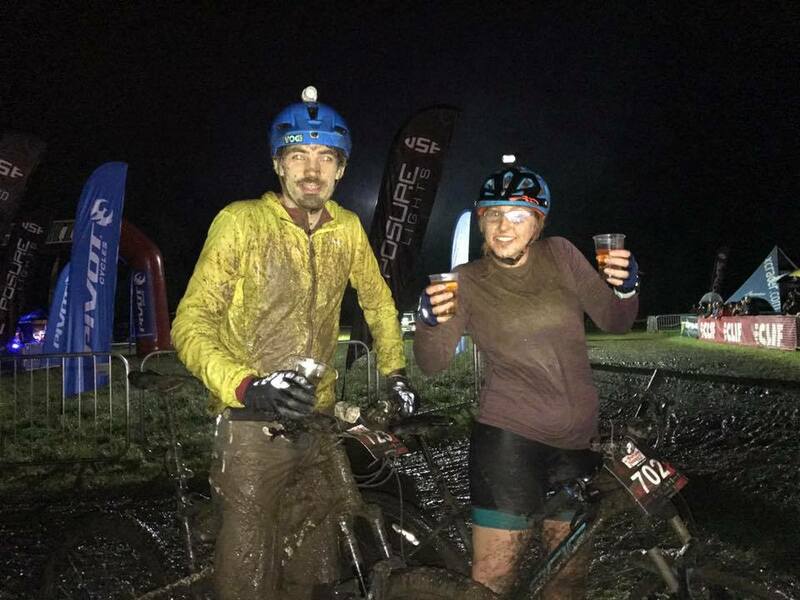 As I handed over the prosecco for a celebratory swig at the end of a gruelling twelve hours in some awful conditions, I couldn’t have been more proud of our girl for not only completing the event (many pulled out due to the weather), but also making the podium. It’s amazing what you can achieve with a lot of hard work, some self belief, and of course, a little help from your friends…. Already sleep deprived and apprehensive, we arrived at a local pub around the corner to meet likeminded people for breakfast. Naturally a good ole English fry up! The weather broke as we ran across the car park, which set the theme throughout the day-moist. At the pub we (me and my partner Nick also riding 12 hour solo for Complete Cycle Works) met the rest of the CCW crew who I had never met before, they all seemed to be taken back and surprised when I had said that I had planned to also compete in the 12 hour solo. Not an unusual or unfamiliar reaction! I’m not sure how much of this had to do with my appearance (I am not your average toned athlete, more cuddly ) or the fact I am female mountain biker or the fact it’s a bit of a daft challenge when you think about it. The journey started last year when I moved in with my partner, an avid mountain biker along with 2 other likeminded fanatics. Listening and hearing them and their friends talk about their most recent race, competition or adventure always interested me, having been out twice on other people’s mountain bikes and doing the occasional spot of road cycling. 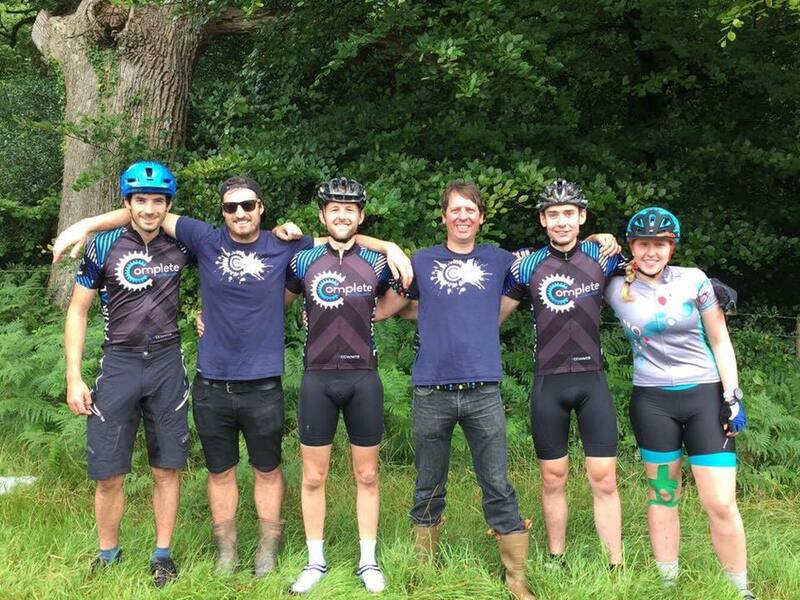 Last year I attended 24/12 as support for others who were mountain biking and was introduced to the YOGI MTB team who made me feel incredibly welcome. I was gripped and entertained from the first moment watching these muddy exhausted and thrilled riders going around and around all describing each twist turn and decent with enthusiasm. I remember at one point late into the night talking to some of the girls (Hannah and Liz) that had been riding about how they got into the sport and wondering whether I could be as good and ‘as cool’ as them to be doing such an awesome event. I like a challenge and I tend to be quite stubborn. Whilst sat around after dinner ‘the lads’ had been sat discussing about the fact the bookings had opened for Pivot 24/12 2017 and were keen to compete, once one was in they were all in. I was sat biting my tongue at the thought of doing something as reckless as I had never competed in a cycling event ever and at this point didn’t own a mountain bike. Was this a little too soon and too much? I had however already applied to complete Dartmoor classic, a road cycling sportive of 67 miles across Dartmoor and figured I would already be having to train for this. Then it happened the switch went and I thought, ‘do you know what, why I can’t compete? There doing it why can’t I??’. I told them there and then that I was doing it, there were some shocked faces and giggles! !– Even more incentive to prove a point. Time to get a mountain bike! I ordered my first hard tail through the cycle to work scheme and upped the amount of cycling significantly from when it arrived Christmas Day! (First set back rolling my car on the A38 on the way home just before New Year’s!). Many months of on and off training later, as life has a habit of getting in the way, it was suddenly race day for which I felt pretty unprepared. The day before race day I had finished nights and was still feeling a little jet lagged, not really feeling it. The weather had set to make the day miserable and wet, not weather I think anyone enjoys let alone wishes to ride in. (Lesson number 2. Always blame the weather). Thankfully we had a spot next to the track to refuel, change clothes and do bike maintenance at. CCW crew were all in the same Gazebo which was a God send as I quickly realised they were suddenly my amazing pit crew providing up to date statistics of where in the race I was, how many more laps I needed to do; to bike maintenance (quickest brake pad change and tire inflating ever seen) and hot chocolate makers, to name but a few things. Without ever asking or knowing they would be there. I cannot thank them enough for the support provided and I am sure they massively influenced my success. There were so many competitor from a huge variety of categories from 12 or 24 hour races in pairs, groups or solo (24hour competitors – just how you did that I have no idea, hats off to you troopers – May be next year???). I was astounded at the amount of female competitors throughout the competition, which made me feel more welcome than I expected. The atmosphere was brilliant despite the awful riding conditions which were ever changing providing new challenges each lap. The support and encouragement given to each other certainly helped me get through each lap and the cheering and words of advice and encouragement on the way around. One of my favourites ‘do it for the girls and girl power’! – What more of an incentive do you need? What I didn’t expect was the emotional roller coaster it was and very much a mental battle to just keep those legs turning through the treacle, rivers and mud. I had the added incentive of committing completing my ride for charity (Devon Air Ambulance- still open on just giving for the generous ones of you out there – https://www.justgiving.com/fundraising/sharrow-carvell1 ), people having pledged money on me completing the ride. I have so far raised six hundred and twenty pounds. My partner also completing in the race passed me once looking about as tired as I felt and still going strong although having trouble with extremely sore muddy eyes. On passing the Gazebo I had heard that he was considering quitting but wouldn’t until I bailed first – naturally as competitive people this again mean’t there was no quitting. Towards the end of the race I was begging my then amazing pit crew to tell me whether I had enough space between me and the other competitors in my category to quit but the competition was strong and they told me I had to give it my all and keep going. Those last two laps were hard, really really hard. But boy am I glad I completed them. About a ¼ of a mile from the finish line I bumped into my partner Nick and we finished the race together. Not knowing all of the Yogi Team and CCW were waiting for us and I was still unsure of my positioning. As we cycled through the finish line over the Tanoy they Said ‘Sharrow Carvell 2ndoverall’, and the teams went wild shouting and cheering us both. Greeted with a finisher’s beer I couldn’t have felt more relieved it was over and elated with my achievement. Later to find out that I had come first place in my category and had the honour of standing on a winner’s podium. Not something I have ever done before! It took a good few days to sink in and recover, I am so pleased I took the leap and took part in an endurance race….. So will I race again… Yes already looking for the next challenge! Naturally I fell as though I should thank some people who I would not of done this without – Revolution Sports Physio , Complete Cycle Works, YOGI MTB club and off course my home bike maintenance and personal motivator Nick.